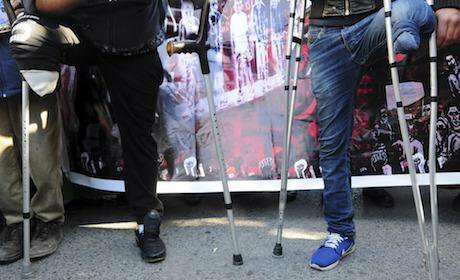 Wounded Tunisians during the 2011 protests take part in a rally to mark the fifth anniversary of the Arab Spring. Picture by Riadh Dridi AP/Press Association Images. All rights reserved. On the 17th and 18th of November, 2016, Tunisia witnessed historic televised public testimonies from survivors and relatives of those who were killed or disappeared under the repressive regimes since the 1950s. How did Tunisia get to this stage in the process of Transitional Justice (TJ)? How has the public event itself unfolded? And what does the nation expect from the process? The 2011 revolution in Tunisia opened up old wounds and an appetite for revenge, but also venues for proper transitional justice. Local need for it was immense and foreign interest soon followed. NGOs set up local branches, key figures poured in from Poland, former Yugoslavia, Spain, Latin America and Africa, to lend support and provide experience. Tunisia was in fact seen, almost immediately, as a test case for implementing transitional justice in the Arab world. The International Centre for Transitional Justice paid special attention to Tunisia immediately after the revolution and held a high-profile international conference in Tunis in April 2011. But the process was not without flaws. The transitional period was the subject of intense political and social debate and pressure. It was chaotic and piecemeal. The chaos came in the form of multiplicity and deregulation of venues for the expression of grievances: impromptu confessions on the streets; television programmes such as mudhakkirat sajin (prisoner’s memories) on the national Channel 2 television; various fora opened up by NGO’s; a number of conferences, most prominently by Temimi Foundation which did more than most to record, debate and even “counsel” victims, publishing more than 5000 pages of accounts. Reparation and restitution for victims of the Ben Ali era in particular became a pressing issue, leading to limiting focus on financial compensation and finding employment for those who were dismissed or excluded for political reasons. There was also a hasty general amnesty, which included high profile Islamist terrorists. In addition, Tunisia did not have a unifying figure around whom the entire nation could unite and reconcile as was the case for South Africa with Nelson Mandela. The 2011 revolution in Tunisia opened up old wounds and appetite for revenge, but also venues for proper transitional justice. All of this soon led to the politicization of elements of TJ, such as reparation, with most leftist former political prisoners generally rejecting it while islamists accepted compensation. One other key point has been how to deal with those associated with the previous regime who quickly rallied against what they perceived as unfair exclusion, and largely won the case. After much debate and pressure, only top officials were banned from politics and only for a short period of time. In fact, key figures of the previous regime soon returned to the forefront. For example, Beji Qaid Sebsi, who was minister under Bourguiba and a high government official under Ben Ali, became Prime Minister and would be later elected President. TJ drugged on despite high cost and high profile, including a dedicated ministry for TJ and Human Rights, headed by the Islamist lawyer Samir Dilou established in January 2012. In addition, the historical dimension was contentious, including how far back would be the start date, which of the major events to include and so on. The Commission for Truth and Dignity (French acronym, IVD) was established in February 2014 and adopted on the 1st of July 1955 as a cutting date for the Truth Commission’s work. Having said that, TJ in Tunisia has enjoyed a rather favorable climate in light of the consensual process that has already resulted in, among other things, a new constitution that establishes the institutions entitled to carry out TJ, as well as worldwide recognition in the shape of a Nobel Peace Prize. The transitional process as a whole was set up in a rather radical and ambitious way, including the election of the Constituent Assembly and the writing of the new constitution. Indeed the Transitional Provisions which are the subject of Chapter X of the constitution stipulate in Article 148, paragraph 9: "the State undertakes to apply the transitional justice system in all its domains and according to the deadlines prescribed by the relevant legislation. In this context the evocation of the non-retroactivity of laws, the existence of previous amnesties, the force of res judicata, and the prescription of a crime or a punishment are considered inadmissible." This was reflected in the 2013-53 Organic Law of 25 December 2013 which details the IVD. Eventually, commissioners were elected by way of a contentious and largely partisan process. The appointment and presidency of the commission have been a source of controversy. IVD is an important institution which resulted from the constitutional phase of Tunisia’s revolution and bears the imprints of its limitations. It came late in the process and was selected and voted in by the National Constituent Assembly with a view to reflect the balance of power within the Assembly. On social media the proceedings were hotly debated and in some instances even denigrated. Such contention reached dangerous levels on the 26th of December, 2014 when several trucks pulled in front of the presidential palace in Carthage with a mission to remove the presidential archive from the palace under orders from IVD, headed by Ms Sihem ben Sedrine. The timing of the Carthage visit was seen as suspicious by some, and propitious by others, depending on political perspective. But the main debate was about the use of the archive, transitional justice and national memory. The country had just elected a new president whose relationship with transitional justice was rather complicated and there was fear he would appropriate the archive in some way. Yet, the outgoing president, Mr Moncef Marzouki, was also known for using the same archive in a name-and-shame campaign detailing the close ties between ben Ali’s regime and hundreds of prominent figures, including writers, academics and journalists in a book known as the Black Book (2013). It was therefore expected that contestation was to accompany the work of the Commission when the balance of power changed after the elections of permanent state institutions (October-December 2014). The law gives the Commission the right to see, and indeed, requisition any document relevant to its work; and it is on this basis that it sought the presidential archive. Experts and several civil society organizations questioned this right and argued that the archive should be secure and in neutral hands (in this case in the National Archive) because it serves more than transitional justice. The archive of the Ministry of Interior remains out of everyone’s reach. In my view, the debate, which accompanied the establishment of the Commission and its composition, in addition to the question of the archive stems from the highly contentious and easily politicised and instrumentalised uses of memory and transitional justice. I deal with these issues elsewhere. Here, I will focus on the latest phase of the Commission’s work, namely the first two sessions of public testimonies. The Commission received 62,318 files of abuse and listened to 12,037 witnesses, a number which would have been much higher if the Commission had the trust of everyone. Of the latter, a wide spectrum of abuse against various political orientations was aired live during the first-ever public hearing in the country. They spoke in front of a selected audience for two evenings in sessions presided over by the members of Commission. The proceedings started off with three mothers telling the stories and pain of losing their sons during the height of the revolution: Ourida Kadousi, mother of Abdarraouf Kaddousi killed in Regab, Sidi Bouzid; Rebeh Dasharaoui, mother of Salah Al Dine Dachraoui, killed in Kasserine and Fatma Hammami, mother of Anis Farhani killed in Tunis. While the President of the Commission insisted on calling everyone a victim (dhahiyya), several speakers refused the label, preferring instead the term militant (munadhil). This was followed by the case of the forced disappearance and death of Kamel Matmati, told by his mother and wife. Then, came Sami Brahem, a well-known Islamist public figure, who spoke of torture and harassment in the 1990s, while the concluding testimony was by Gilbert Naccache, a Leftist Tunisian Jew who was imprisoned and tortured in the 1960s and 70s. The event was attended by prominent politicians but not by any of the three presidents (House of Representatives, government, and republic), something which raised serious questions. The second evening was less official and featured three cases of death under torture, one communist, Nabil Barakati killed in 1985 and two Islamists, Faysal Barakat and Rached Chemmakhi, all told by close relatives of the victims. The repression of the 2008 protest movement in the Mining Basin was told by the former prisoner Bechir Laabidi and his wife while Besma al-Bal’i, an Islamist woman activist, testified about her own imprisonment and torture. Finally, the repression of the Pan-Arabist Youssefist movement in the late 1950s was narrated by the Youssefist Hamadi Ghars. There is no doubt that Tunisia was gripped by the event. On social media the proceedings were hotly debated and even denigrated, in some instances, due to the controversy over the Commission and particularly its president, accused of being close to Islamists, the former president and even to foreign agendas. But the witnesses made sure that stress was put firmly on the abuses of the previous regimes. The survivors and relatives of victims themselves managed, in my view, to refocus Tunisia on the revolution and on how much has been achieved by deposing Ben Ali at a time when over the past few years a systematic campaign is spreading doubt to discredit the revolution. Ourida Keddousi, for example, addressed the former president directly challenging him to try and return to the country, while others detailed the types of reparations they would like to see happen. Here, two key elements emerged. The first was a complete absence of material demands in the form of financial compensation or jobs, etc. The second was an interest in hearing confession by torturers, complicit doctors and others about their role in torture and abuse. Brahem said he would forgive his torturers if they came forward, apologised and explained what motivated them. Rida Barakati, the brother of Nabil who was killed under torture, asked for the police station where his brother was detained to become a library and a home for civil society associations, offering the family’s own library. Kamel Matmamti’s wife asked for a proper and official burial and recognition of her husband as a martyr. A remarkable statement by Nabil Barakati was his open pride in his brother’s communist affiliation, considering it a badge of honour. Remarkable as well were the fluency, charisma and persuasions of the speakers. The pain was palpable, but there was much less emotional display than what would have been expected, or indeed compared to South Africa’s testimonies, for instance. In a word, there was a powerful pride by survivors in what they have done and in their family members, but also in the manner of their conduct during the public appearances. Dignity, the main slogan of the revolution, was plain to see. Truth was the open aspiration of all. Vengeance was rarely evoked but the desire for justice was unanimous. There were, as well, rifts between the Commission and the witnesses. While the president of the Commission insisted on calling everyone a victim (dhahiyya), several speakers refused the label, preferring instead the term militant (munadhil). This seemingly linguistic disagreement is symptomatic of something deeper. Despite a global awareness about the issue by which one speaks of survivors of torture and repression as well as victims, in Tunisia there is clearly no agreed terminology, and perhaps no agreement over the intended aim of the public testimonies themselves. On the part of witnesses, victimhood was rejected while struggle, activism and resistance were embraced. The speakers insisted that they have won the fight against fear and repression. What they have not won yet was proper recognition and justice. In terms of performance, neither the venue nor the set up were able to convey the aura of the moment. The panel of commissioners sat on a high table in the centre stage, with witnesses to their left. Across from the panel, sat the audience all on one level, with politicians, rather than survivors and their families, occupying the front seats. The hierarchy was clear, the effect, whether intended or not, was more prominence to the Commission itself. Unlike the South African model, witnesses did not have much support around them. Those among them who were accustomed to public speaking engaged with the audience as well as the Commission; others simply faced the latter, almost never speaking to the camera, and therefore never to the television audience directly. That connection was somewhat lost (In fact, even the television signal was lost for a while during the first day). If we looked past these lacunae and possible instrumentalisation of this historic event, we would realise that the Tunisia which emerged from the testimonies themselves gives cause for hope. In fact, one immediate effect has been the creation of a confessional mood across the country, resulting in unsolicited testimonies on social media and wide circulation of eyewitness accounts, written memoirs and documentaries. The hope does not consist in establishing truth – testimonies, authentic and heart wrenching as they are, remain subjective and relative – but in calling on Tunisia to reckon with its past and challenging it to implement proper accountability and justice. With only rare prosecutions, no serious reform of the system and continued impunity to those responsible for past abuses, that challenge remains, in my view, the crucible of the transitional justice process in the country.